In the high-stakes world of cancer research, Dr. William Shumway has just made a stunning breakthrough. But is it really the long-sought cure for cancer? Despite the young scientist’s reservations, a senior mentor pressures him to trumpet his findings to the world. Part medical drama, part suspense-filled thriller, Secret Order turns its microscope on bioethics, money and power. An L.A. Theatre Works full-cast performance featuring Angela Goethals, Will McCormack, Richard Schiff and George Segal. 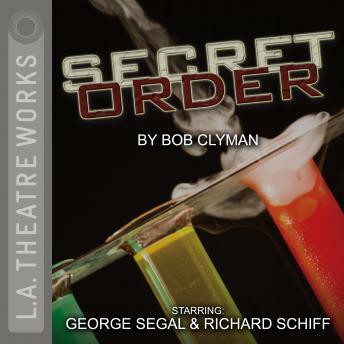 Secret Order is part of L.A. Theatre Works’ Relativity Series featuring science-themed plays. Major funding for the Relativity Series is provided by the Alfred P. Sloan Foundation to enhance public understanding of science and technology in the modern world.